I have several pieces of Slinky separates and love how comfortable they are! Theyre perfect for the office and when I travel I just roll them up in the suitcase and never worry about wrinkles. Theyre the best! I rarely write reviews but know buyers rely on them as I do before I buy. This was a very nice outfit and Ive received many compliments the first day I wore. Very flattering on the body. Top covers without being bulky, Top true to size but pants a little wiggle room which doesnt matter much since top covers. That being said Id order true to size. Get it while the price is right. You will receive compliments and they will ask where you got it. Very flattering and unique. Fringe?? Check! Tunic?? Check! Slim not overly billowy?? Check & Check!Flattering / Cheeky / Fun??? 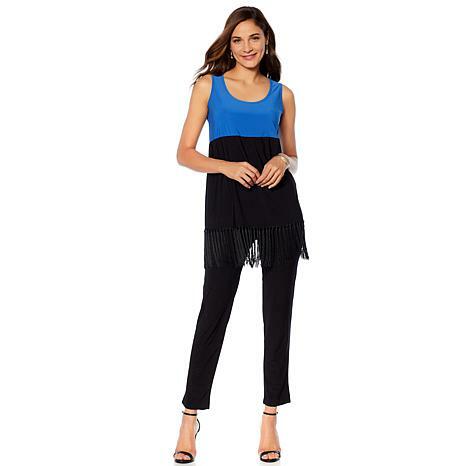 Oh yes, tre' Check!I love the fit of the tunic, it's the right length PRIOR to the fringe fun on the bottom, The pants are perfect for this set - and useful with tons of other outfits too. I got the black and white in medium. I'm a chubette 5'5" and about 148lbs. This set fit me with wiggle room - and wiggle is a must in this tunic top! So Happy With This.